Curiosity crept up on Namib Dune, a large dune within the Bagnold Dunes on Mars, for a science pit stop on its way to the foothills of Mount Sharp. It’s currently performing the first up-close investigation of an active sand dune not on Earth. The robotic explorer was supposed to bump and scuff the sand on Sol 1217 (the 1,217th day of its mission on Mars), exposing fresh material for analysis. But something happened to trigger failsafes, delaying activity. While its human scientists back on Earth puzzled over what happened, Curiosity focused on opportunistic science by analyzing the chemical composition of the grains. 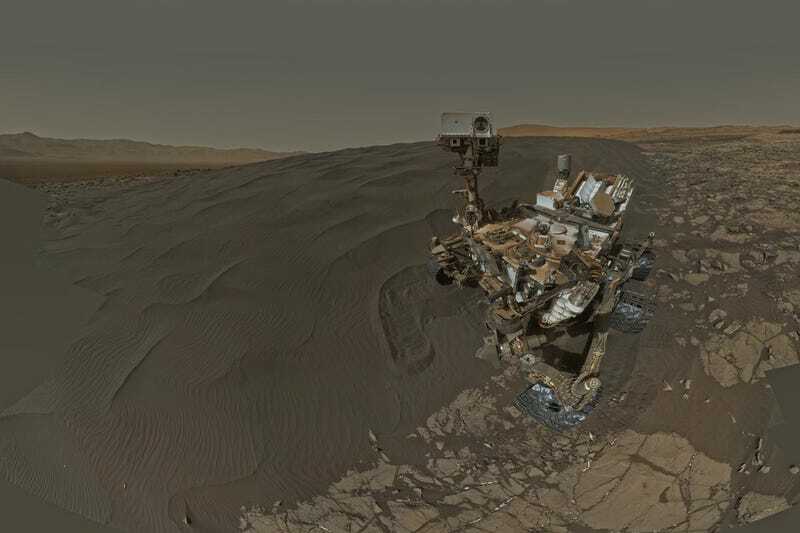 Over the next few days, while it was stuck at the bottom of the dune, Curiosity took photographs. These will be analyzed to detect any changes in the sand dunes. We know from satellite observations that the Bagnold Dunes are very active, migrating up to 3 feet during an Earth year. The robot also measured wind speeds, to link wind and dune migration. Hopefully it can catch a sand slide (a miniature landslide down the face of the dune) in progress. The robot is also photographing its own surfaces to check for sand buildup. The scuff finally happened on Sol 1221, exposing fresh grains while confirming that the sand was deep enough to scoop a sample without banging into hard rock. Sand in dunes is naturally sorted by density, with wind blowing the finest, lightest grains farther than larger and heavier grains. So mission scientists need to deliberately collect samples of different grain sizes. On Sol 1224, a scoop of sand was run through a fine sieve to get just the tiniest grains (under 0.006 inches diameter), then fed into a chemical analysis suite on the rover. After running a full workup, the pile was dumped and the rover scooped up a second sample. This time, it ran it through the fine sieve as usual. Then, Curiosity used its coarse sieve. The robot dumped the rejected larger particles into the second sieve, sorting out anything larger than 0.04 inches. The largest material was dumped, but the remaining sample of grains were routed into the analysis kit. Instead of just dumping it through the portioner, the team vibrated the scoop, gently tilting it until the material flowed in a tiny stream into the collection area. Unfortunately, the collection arm behaved unusually while processing a third sample from the dune, leaving terrestrial scientists once again troubleshooting from afar. Top image: Curiosity on Mars. Credit: NASA/JPL-Caltech. Have Google Cardboard? Check out the scene here.